Stars from popular reality TV show, The Voice, Prinnie and Mahalia, performed at Haberfield Public School Signing With 600,000 Kids Across The Country to make it Australia’s Biggest Music Gig of its kind. Hundreds of thousands of school children across Australia sang the same song at the same time on the same day in Australia’s biggest annual school music gig, 'Music: Count Us In’. Now in its sixth year, Music: Count Us In 2012 culminates on Thursday November 1 at 12.30pm (AEDT). 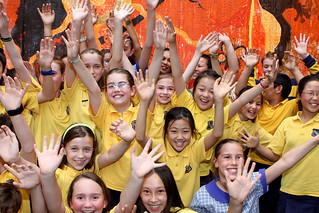 The program highlights the value of music education in Australian schools. Research shows that music education has lost its place in many schools, despite its range of benefits to students’ development. This year's program involves a record breaking 1900+ schools. From Brisbane to Bunbury and Darwin to Devonport, students across Australia will sing the program song, ‘Different People (Stand Together)’, written by three high schools students with help from award-winning singer/songwriter Josh Pyke. In CANBERRA, the Federal Minister for School Education, Peter Garrett, will count down the performance with 1800 kids from ACT schools in front of Parliament House. Prinnie and Mahalia kick off their Come Together National Tour tomorrow - November 2. Music News Australia, Eva Rinaldi Photography and associates congratulate the big team effort and wish the performing artists well on their upcoming tour. Performing arts and education once again prove a winning combination.